This paper describes an uncommon case of DD type I in a 7-year-old girl, highlighting the clinical and radiographic variations of the defect as confirmed by histopathological examination. A 7-year-old girl was referred to the Department of Oral and Maxillofacial Radiology, Dentistry Faculty, Erciyes University complaining mobile teeth and a swelling in the maxillary deciduous right incisor area. According to the patient's father, the patient had lost her mandibular central incisors teeth by the age of 3 and mandibular left primary second molar by the age of 5. Her older brother had a similar condition. Furthermore, the patient's mother reportedly became edentulous at an early age and had required full maxillary and mandibular dentures. The grandfather of the girl stated that he too had a history of delayed eruption. He further stated that he had lost most of his teeth at an early age because of spontaneous exfoliation, which had necessitated a full denture in the maxilla and a partial denture in the mandible by the end of his adolescence. Dental examination of the patient's father revealed no evidence similar condition. The patient's medical history revealed no evidence of disturbance in general health. The patient was having class III malocclusion with spacing between maxillary and mandibular anteriors. Clinical examination revealed an anterior open bite and mandibular prognatie [Figure 1]a. The intraoral examination revealed the following teeth, which were of normal size, morphology and color, to be present: 55, 54, 53, 52, 51, 61, 63, 64, 65, 74, 73, 31, 41, 83, 84, 85. The dentition was free of caries [Figure 1] b-d. There was grade I mobility of 31 and 41, grade II mobility of 55, 54, 53, 63, 64, 65 and grade III mobility with 51, 52, 61,83,84,85. All the teeth were normal in shape and size. There was a painful fistule on the buccal region of the maxillary right primary central incisor Periapical radiolucencies were present at the permanent upper central incisors. The panoramic radiograph revealed features of dentine dysplasia type I with normal appearance of crown but no root development in relation to 51, 52, 54, 55, 64, 65, 73, 74, 83, 84, 85, 16, 26, 36, 46, 11 and 21, slight root formation in relation to 31,41,53 and 63. Pulp chambers were obliterated and bone below the teeth showed well-defined margins, and periapical radiolucencies were not seen. All permanent teeth were present except third molars [Figure 2]. On the basis of the clinical and radiographic appearance, a diagnosis of DD type I was suspected. The maxillary primary central incisors, right lateral incisor, mandibular primary right canine, first and second molars mandibular left second premolar was extracted owing to extensive mobility [Figure 3]. Extracted teeth were sent to an oral pathologist for histopathological examination. The ground section was examined with a stereomicroscope; the superficial dentin of the crown appeared normal, but the pulp chamber was obliterated by an unusual type of calcified material consisting of dentin, and the deeper layers of dentin had an atypical tubular pattern [Figure 4]. These features are consistent with the clinical diagnosis of DD type I. On the basis of the clinical, radiographical and histopathological examinations, the patient was diagnosed with DD type I. In a follow-up visit 2 months after the initial examination, remaining deciduous teeth were removed under local anesthesia due to excessive mobility. Overdenture-style removable dentures were advised to meet the patient's functional, phonational, and esthetic requirements but both the patient and her father refused this treatment plan. The patient was observed with an excellent in oral hygiene. The patient continues to be followed up by our department. suggest that they are the result of pulpal necrosis, occurring either secondary to caries or spontaneously. DD type I should be differentiated from DD type II, dentinogenesis imperfecta and odontodysplasia  Flynn and High  reported an interesting case. In that study, teeth had some of the radiographic features of DD type I, as well as some of DD type II and of dentinogenesis imperfecta. DD is recognized as a genetic disorder and is thought possibly to be a single gene mutation. When multiple family members have a similar pattern of pathosis, this supports a diagnosis of a hereditary condition. An attempt to identify a familial history in our case, the patient's older brother, mother, and grandfather had similar condition. Although from the patient's description, it was not possible to examine them to reach any conclusive diagnosis. Histologically, the immediately subjacent dentin and the enamel appear normal. 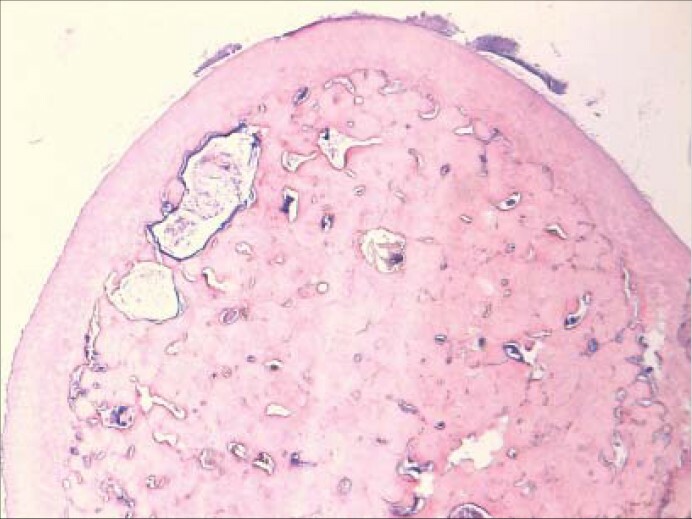 Deeper layers of dentin with demonstrate an atypical tubular pattern with amorphous, atubular globular, or nodular masses of abnormal dentin are seen. The periapical radiolucent areas seen in most cases of dentinal dysplasia have been interpreted as radicular cysts; however, in some cases, a diagnosis of periapical granuloma has been reported. , Teeth with histological or radiographical characteristics of DD occur in a number of disorders such as Ehlers-Danlos syndrome, calcinosis, brachioskeletogenital syndrome,  rheumatoid arthritis, and vitaminosis D  Some association has also been reported between DD and osseous changes in addition to sclerotic bone formation  but our patient had no signs of other pathologic conditions. Therapy, including extraction of all teeth, curettage of cystic alteration, and functional rehabilitation by the insertion of a conventional complete denture, has been presented previously by Neumann et al. Munoz-Guerra et al. reported successful treatment of a 24-year old female after onlay bone grafting and sinus augmentation. It is anticipated that a lot of permanent teeth may be lost due to severe mobility and may undergo spontaneous pulpal necrosis. The possibility of endosseous implants is being explored for when the patient reaches her late teens and growth is complete. Though many cases of DD type I have been described some clinical aspects and theoretic issues remain uncertain. Early diagnosis of the condition is important for the initiation of effective preventive treatment. Follow-up studies on patients with DD type I might provide insights into treatment strategies. Future molecular genetic research may determine precise information about the gene locus responsible for DD type I. 1. Shafer WG, Hine MK, Levy BM. Developmental disturbances of oral and paraoral structures. In A text book of oral pathology; 4 th ed, Philadelphia: Elsevier Science, Saunders Co.; 2003. p. 2-85. 2. Kim JW, Simmer JP. Hereditary dentin defects. Dent Res 2007;86:392-9. 3. Ballschmiede G. Dissertation, Berlin. Malformations of the jaws and teeth. In: Herbst E, Apffe lstaedt M, editors. New York: Oxford University Press; 1930. p. 286. 4. Rushton MA. A case of dentinal dysplasia. Guy's Hosp Rep 1939;89:369-73. 5. Witkop CJ Jr. Hereditary defects of dentin. Dent Clin North Am 1975;19:25-45. 6. 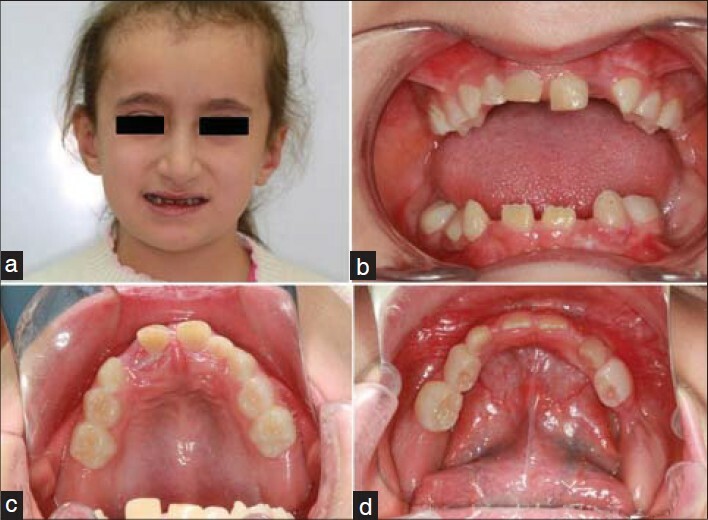 Toomarian L, Mashhadiabbas F, Mirkarimi M, Mehrdad L. Dentin dysplasia type I: A case report and review of the literature. J Med Case Rep 2010;4:1. 7. Ciola B, Bahn SL, Goviea GL. Radiographic manifestations of an unusual combination type I and type II dentin dysplasia. Oral Surg Oral Med Oral Pathol 1978;45:317-22. 8. Depprich RA, Ommerborn MA, Handschel JG, Naujoks CD, Meyer U, Kübler NR. Dentin dysplasia type I: A challenge for treatment with dental implants. Head Face Med. 2007;22;3:31. 9. O Carroll MK, Duncan WK, Perkins TM. Dentin dysplasia: Review of the literature and a proposed subclassification based on radiographic findings. Oral Surg Oral Med Oral Pathol 1991;72:119-25. 10. Duncan WK, Perkins TM, O Carroll MK, Hill WJ. Type I dentin dysplasia: Report of two cases. Ann Dent. 1991;50:18-21. 11. Ravanshad S, Khayat A. Endodontic therapy on a dentition exhibiting multiple periapical radiolucencies associated with dentinal dysplasia Type 1. Aust Endod J. 2006;32:40-2. 12. Shankly PE, Mackie IC, Sloan P. Dentinal dysplasia type I: Report of a case. Int J Paediatr Dent 1999;9:37-42. 13. Barron MJ, McDonnell ST, Mackie I, Dixon MJ. Hereditary dentine disorders: Dentinogenesis imperfecta and dentine dysplasia. Orphanet J Rare Dis. 2008;20;3:31. 14. O Carroll MK, Duncan WK. 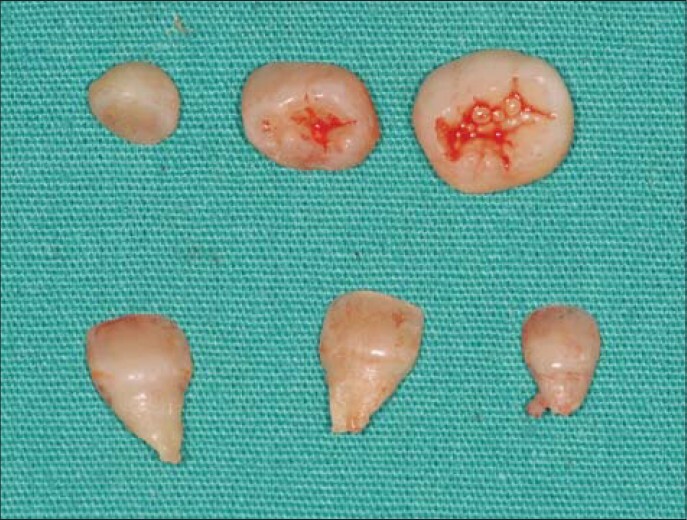 Dentin dysplasia type I. Radiologic and genetic perspectives in a six-generation family. Oral Surg Oral Med Oral Pathol 1994;78:375-81. 15. Shields ED, Bixler D, el-Kafrawy AM. A proposed classification for heritable human dentine defects with a description of a new entity. Arch Oral Biol 1973;18:543-53. 16. Logan J, Becks H, Silverman S, Pinnborg JJ. Dentinal dysplasia. Oral surg. 1962;15:317-33. 17. Steidler NE, Radden BG. Reade PC. Dentinal dysplasia: A clinicopathological study of eight cases and review of the literature.Br J Oral Maxillofacl Surg 1984;22:274-86. 18. Flynn CM, High AS. The diagnosis of dentinal dysplasia Type 1. Dentomaxillofac Radiol 1993;22:43. 19. Comer TL, Gound TG. Hereditary pattern for dentinal dysplasia type Id: A case report. Oral Surg Oral Med Oral Pathol Oral Radiol Endod 2002;94:51-3. 20. Melnick M, Levin LS, Brady J. Dentin dysplasia type I: A scanning electron microscopic analysis of the primary dentition. Oral Surg Oral Med Oral Pathol Oral Radiol Endod 1980;50:335-40. 21. Coke JM, Del Russo G, Remeikie N, VanCura JE. Dentinal dysplasia type I. Report of a case with endodontic therapy. Oral Surg 1979;48:262-8. 22. Perl T, Farman AG, Elizabeth P, Town C. Radicular (Type I) dentin dysplasia. Oral Surg Oral Med Oral Pathol 1977;43:746-53. 23. Morris ME, Augsburger RH. Dentine dysplasia with sclerotic bone and skeletal anomalies inherited as an autosomal dominant trait. Oral Surg Oral Med Oral Pathol 1977;43:267-83. 24. Ansari G, Reid JS. Dentinal dysplasia type I: Review of the literature and report of a family. ASDC J Dent Child 1997;64:429-34. 25. Neumann F, Würfel F, Mundt T. Dentin dysplasia type I-a case report. Ann Anat 1999;181:138-40. 26. Muñoz-Guerra MF, Naval-Gías L, Escorial V, Sastre-Pérez J. Dentin dysplasia type I treated with onlay bone grafting, sinus augmentation, and osseointegrated implants. Implant Dent 2006;15:248-53.